Conversations like this between Mums are so jolly common these days. We are told repeatedly how unique and individual our babies are, with their distinctive personalities and particularized requirements. Yet when it comes to tired babies, it seems many parenting ‘gurus’ give just one set of advice for all babies – but each expert’s ‘golden rules’ can seem to be significantly different to the next expert’s ‘magical secrets’. All in all, parenting a tired baby can feel like a fiercely confusing topic. Yet, if we go back just 40-50 years when new babies and their mums all stayed in hospital for 1-2 weeks, somehow those midwives and maternity nurses managed to have nearly all the babies on well-established sleep-feed-awake-sleep routines before they went home. There just didn’t seem to be nearly the same amount of mother’s complaining of poorly-sleeping infants. And one of the main reasons is frustratingly simple … it’s because babies born in the 70’s, 60’s and earlier, tended to have significantly quieter and more predictable lives, sometimes completely devoid of over-stimulation. But today’s Westernized wee babies can truly suffer through their over-tiring little lives … car drives, shopping errands, supermarkets, coffee group outings, pram jogs, gym crèche, coffee shop lunches … busy, busy, busy! These days many of our babies are born into a strange new cultural combination of assuming them to be utterly irreplaceably precious (whereas 100 years ago parents often accepted the probable fate that not all their children would survive) – yet conversely today’s babies are also treated with a kind of durable, flexible, portable take-them-everywhere attitude (whereas 100 years ago ‘delicate’ mothers and ‘fragile’ babies often stayed mostly at home for the first 4-6 weeks). Body tensing. Stiff body / arching backwards. Fists clenching and jerky arm/leg movements. Flailing arms, kicking legs. Frowns & grimacing. Angry disposition. Grumpy cranky fussing grizzling, whining grunting, then nasal-sounding wailing cry. Short wailing cries escalating to long hard crying. Head moving from side-to-side. Head turning away from light or people, & loosing eye contact. Sucking fists. Jittery or pale mouth. Big blinks. Wide-eyed alert or spaced-out stare. When picked up, buries head into parent’s chest. When picked up, squirms / buries head into parent’s chest. There are great simple things we can do to assist our babies to sleep well. Firstly, watch out for their individual Tired Signs. Each baby of course does have a unique personality, and so it is a matter of really getting under the skin of your baby to be able to ‘read’ his or her Tired Signs. Secondly, know that young babies can go from Tired to Over-Tired in as short as 5-10 minutes. So with newborns for instance, expect that around just 1½ hours after they first wake up, they will display Tired Signs. Then, it’s vital to quickly use this short window of time to put Bubs to bed – tired and awake, not over-tired and conked out. Thirdly, know that the ideal daytime routine is sleep, then feed, then play, then back to sleep. The exceptions are, to expect extra feeds before the longest evening sleep, and to cut out the ‘play’ time between feeds during the night. But the golden rule is: Babies should wake up because they are hungry – not go to sleep because they are exhausted. Fourthly, swaddle your baby, either in a swaddling cloth or swaddling wrap – but gently package their uncontrollable arms and sharp nails ‘like a burrito’ because young babies have very little control over their limbs. Fifthly, try to dedicate the first six weeks to your baby – let everything revolve around your baby being able to have a quiet, consistent, predictable routine. Establishing great sleep habits in the first six-eight weeks can pay enormous dividends for years! Remember, all babies are born with the ability to sleep unaided (they’ve been doing it for months already). Finally, turn the TV off! To your adult brain the TV can simply be background companionship to your day, but to a young baby a dominating lounge screen that is constantly flashing bright colours and emitting endless noise, is stimulation overload! If you can’t handle the silence (which actually can be quite golden) then turn on an easy-listening radio station or play some gentle relaxing music CDs. But think in terms of soft sounds. Note: Young babies who don’t day-sleep but do sleep through the night, are doing so by default. In other words they sleep out of sheer exhaustion – not because they’re naturally a good night-time sleeper. 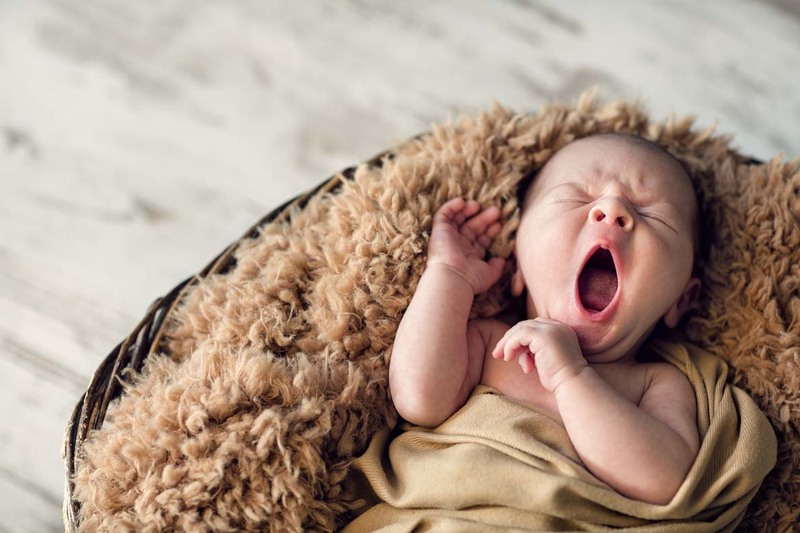 Once older and less fatigued, evening sleep-resistance problems are likely to occur, just as they are already occurring for day-sleeps and probably middle-of-the-night wake-ups … because the infant hasn’t learnt to fall asleep without the aid of extreme fatigue.